Turkey has always shown little understanding of the environment, also from an ecological point of view. It has shown no mercy towards nature and people, destroying the landscape and burying a millennia of history under water. One of the most perverse and ruthless ways of interfering in a country without actually entering it is by cutting or reducing its water supply. Turkey has been doing this for decades (together with military operations, bombing and illegal occupations) in an attempt to blackmail neighbouring countries, especially Syria and Iraq. Kurdistan lies in the most fertile lands of that area, the historical Mesopotamia, the land between the two rivers (the Tigris and the Euphrates). And it is for this reason that Kurds and their land have been subjugated and forced to suffer enormous pressure and repression, and ultimately were divided into four parts to please each of the other contending powers (Syria, Iraq, and Turkey above all) in the region and their foreigner “godfathers” (France, Germany, and the UK). Turkey has always shown little understanding of the environment, also from an ecological point of view. It has shown no mercy towards nature and people, destroying the landscape and burying a millennia of history under water in the name of a failed economic growth and development plan (as was the case in Zeugma and now Hasankeyf). Turkey have built dams (like in the Dersim [Tunceli] areas), changed the course of rivers with the most devastating effects (entire areas in Dersim have literally dried out, the fauna and flora disappeared) and displaced thousands of people with the double aim of tightening even more control over them, and pumping money into building societies conveniently connected to members of the government. Political and strategic reasons are strongly intertwined with economic reasons (or rather, how to secure the enrichment of the few at the expense of the many), and now a new alarm has been raiised: the al-Hurriyah dam is located in the town of Al-Mansoura, some 25 kilometres east of the Euphrates dam in al-Tabqa. Turkey controls many dams on the Euphrates, as they are located in a territory under its authority. And of course, Turkey can “play” with water levels according to its wishes, as it is literally able to “open” and “close” the tap as it likes. The effects of this are clearly devastating for people dependant on the water of the Euphrates for their lives, irrigation and economic sustainability. 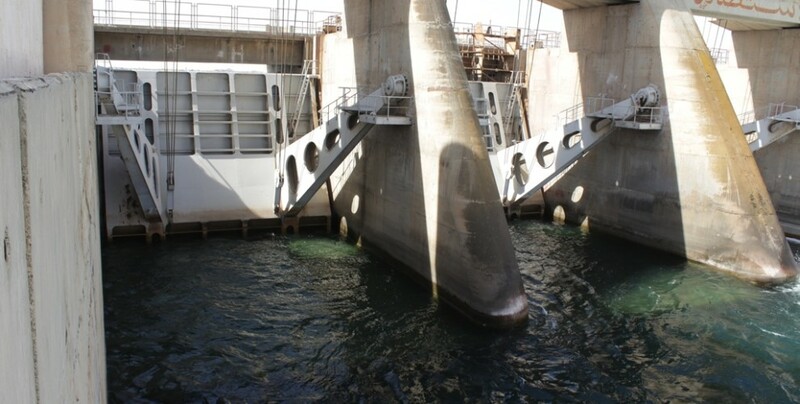 According to some reports, the water in the al-Hurriyah dam has been reduced by more than 2% and this has led to the closure of the flood gates and the halting of the generation groups [sic]. Fingers are pointed at Turkey, who is accused of having deliberately reduced the working time of the generation groups (from 24 to 12 hours), thus reducing the amount of water generated by each group. Thousands of families in al-Tabqa depend on the Euphrates to irrigate their crops on both banks of the river. The Euphrates is the main source of water supply for people in the provinces of Raqqa, Deir ez-Zor and Aleppo. Closing the “tap” means the level of water will fall and this will be even a bigger problem now that summer is approaching and water evaporates more quickly. Some experts in the area warned that the consequences of Turkey’s actions could be very serious, inducing drought and increasing the risk of desertification in a region faced with a hot summer and a huge water demand. People in the affected areas are ─ not for the first time ─ calling on the international community and relevant agencies to act and stop Turkey, before is too late.